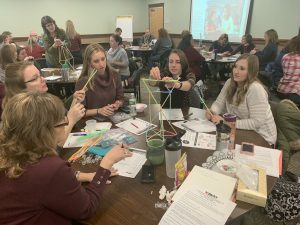 School counselors and psychologists gathered recently for a day of collaboration and the topics of discussion centered around suicide prevention, adverse childhood experiences, and trauma-informed care. As the group discussed the impacts of social supports and ea rly intervention, one tool used in the training was The Brain Architecture Game, a tabletop game experience that builds understanding of the powerful role of relationships on early brain development- what promotes it, what derails it, with what consequences for society. BLaST IU 17 is excited to offer this experience to schools to inform all staff of the impact childhood trauma can have on life’s trajectory. It can be played in small training workshops, conferences, and large events. Your school or organization may benefit from this valuable resource for creating a common understanding of how environment, experiences and genes shape brain development. The brain does not build itself. It’s group work. Parents, teachers, coaches, anyone who spends time with kids can help influence the development of their abilities. For more information, visit www.IU17.org.